Looking for a new varmint hunting round for your .22 Hornet? 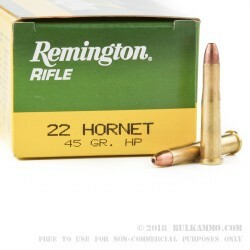 The Remington .22 Hornet Express rifle round is an excellent choice for plinking, target practice and small game/pests. 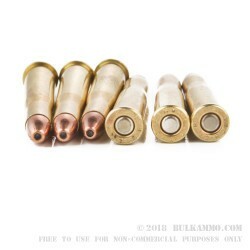 These boxer-primed rounds are noncorrosive, encased in reloadable brass cases and feature a 45-grain hollow point projectile capable of a muzzle velocity of 2690 FPS. 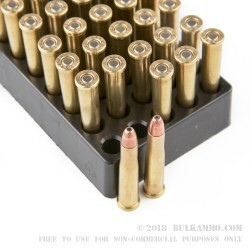 Able to deliver a high terminal velocity, in conjunction with decent expansion, these rounds are an ideal hunting option for squirrels, rabbits and other small game. 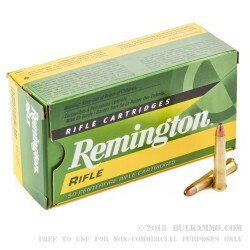 Each box of Remington Express rifle ammunition comes with 50 rounds of .22 Hornet ammunition. Remington is America’s oldest manufacturer of guns and ammunition and continues to push the boundaries of firearms technology while retaining legendary performance and quality.